Figure 1. Source: Office of Surface Mining Reclamation and Enforcement. The previous two posts have reported on the amount of abandoned mine land in Missouri and neighboring states, how much of it is high priority, how much of it has been reclaimed, and how much remains to be reclaimed. Coal has been one of the world’s most important industrial fuels, and for most of the last 100 years it has been the primary fuel from which we generate electricity. One of the reasons America grew to be an economic powerhouse was because we had abundant energy resources, and coal was one of them. West Virginia, Kentucky, Illinois, and Pennsylvania are currently the largest producing eastern coal states, in that order. Because their coal is high in sulfur, however, some coal production moved to the West, where the coal is lower in sulfur. Wyoming is now the nation’s largest coal producer, producing 39% of the nation’s coal. Missouri is a coal producing state, though our production has been small compared to the high producing states. 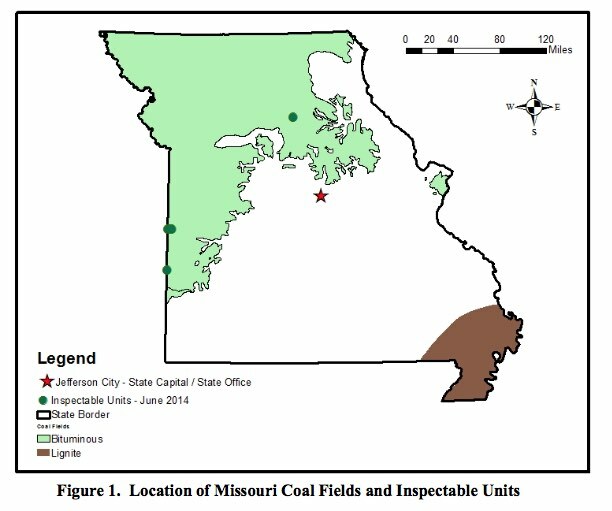 As Figure 1 shows, a significant portion of the state is underlain by coal. The majority of the coal veins are thin, however, and tend to be high in sulfur. Thus, coal mining never became the huge industry that it did in some other states. Figure 2. Source: Office of Surface Mining Reclamation and Enforcement. Coal mining began in Missouri in the 1840s. It peaked in 1984, when almost 7 million tons were mined. But since then, production has trended lower, and 138,206 tons were mined in 2015, only 2-3% of peak production. In contrast, Wyoming mined 387.9 million tons, hundreds of times more. Figure 2 shows the trend since 1994. Currently, the coal used to generate Missouri electricity is about 90% Wyoming coal, 10% Missouri coal. Other kinds of mining began in Missouri even earlier, as early as the 1740s. At one time, Missouri was the primary source of lead in the United States. As many as 67,000 acres of unreclaimed land were abandoned by the coal industry, and 40,000 acres by other mining operations. Missouri’s land reclamation program was established by state law in 1974, when the Department of Natural Resources was created. But it got a big boost with the passage of the federal Surface Mining Control and Reclamation Act in 1977. This law provides minimum requirements for mines, funding, and oversight of state reclamation efforts. As we saw in the previous post, some states have an abandoned mine land problem many times greater than does Missouri, and their reclamation efforts receive higher levels of funding than does ours. Funding has varied from year-to-year with budgetary woes and shifting priorities. But Missouri and other states have been working to reclaim abandoned mine lands since the 1970s. As we saw in the two previous posts, abandoned mine lands are classified into 3 broad categories. Lands that pose an extreme danger to health and welfare are classified Priority 1, and lands that pose a threat to health and welfare are classified as Priority 2. Land that has been degraded by mining operations, but which is not a threat to health and welfare, is classified as Priority 3. Priority 1 and 2 lands are classified as high priority. The law requires their reclamation before Priority 3 lands are addressed. In addition, the law requires abandoned coal mining land to be addressed before other types of abandoned mine lands, I’m not quite sure why. As reported in the previous 2 posts, Missouri has made significant progress in reclaiming its abandoned mine land. But it is a very, very big and expensive job. Because the units to be reclaimed can be of so many different types, and because funding levels control the rate of reclamation, I think that estimated costs may give the best picture of what’s been accomplished and what remains to be done. By cost, Missouri has completed about 1/3 of its work to reclaim Priority 1 and 2 land. However, that does not include Priority 3 land. At the 2014 funding level, it will take Missouri 3-4 decades to complete reclamation on Priority 1 and 2 land, and about 8 decades to finish the job completely. Unfortunately, not all abandoned mine lands have been inspected. As they are, unless Missouri devotes more resources to the job, the time to completion is likely to grow. U.S. Energy Information Administration. 2015. Frequently Asked Questions: Which states produce the most coal? http://www.eia.gov/tools/faqs/faq.cfm?id=69&t=2. Viewed 4/16/2015. Alton Field Division, Office of Surface Mining Reclamation and Enforcement. 2017. Annual Evaluation Report for the Regulatory Program and the Abandoned Mine Land Program Administered by the State Regulatory Authority of Missouri, For Evaluation Year 2016.. U.S. Department of the Interior. https://dnr.mo.gov/geology/lrp/docs/16annualevaluationreport.pdf. Missouri Department of Natural Resources. 2014. 2012-2013 Land Reclamation Program Biennial Report. http://dnr.mo.gov/pubs. Missouri Department of Natural Resources. 2016. 2014-2015 Land Reclamation Program Biennial Report. http://dnr.mo.gov/pubs. By mogreenstats in Land, Pollution - Land on 2017/09/07 .